This oil painting of Valentino Rossi on his 2018 Yamaha YZR-M1 MotoGP prototype race bike took about 6-8 weeks full time work. It is possibly the most detailed single motorcycle racer oil painting I have ever done. I use Winsor and Newton Artist Oil Paints and Rosemary and Company Artist Brushes on a linen canvas. It is available as a fine art print on the MotoGP page on this website. 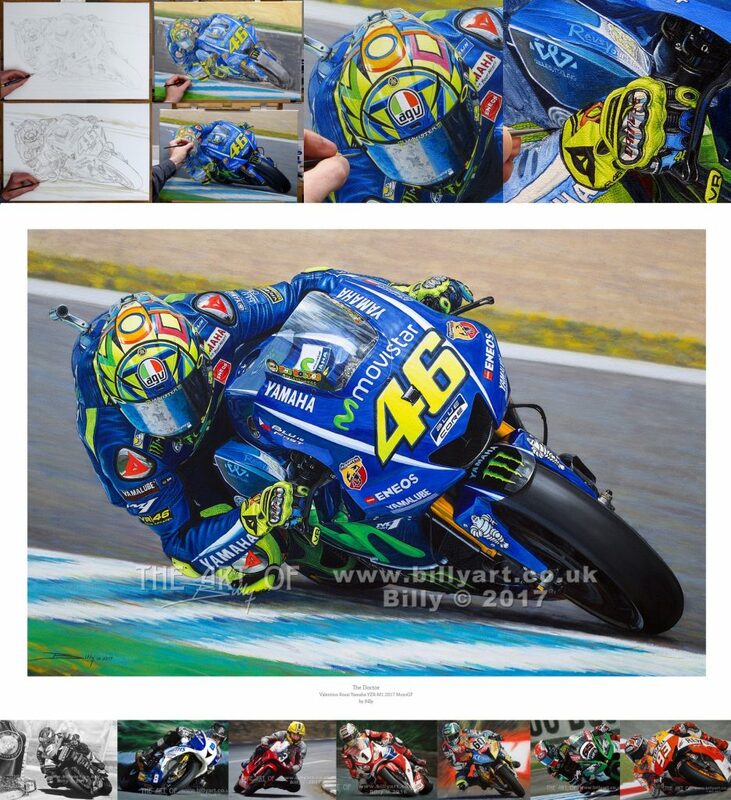 This entry was posted in Motorcycles and tagged MotoGP, Motorcycle, Motorcycle Art, Oil Painting, Rosemary and Company Brushes, time-lapse, Timelapse, Valentino Rossi, Winsor and Newton, Yamaha, YZR M1 on 06/04/2019 by billy. Here is my full timelapse of my oil on linen canvas painting ofJonathan Rea riding the Factory Kawasaki ZX-10R Superbike to become the 2017 World Superbike Champion for the third time in succession. Jonathan made history as the first consecutive Triple WorldSBK Champion. The oil painting shows Jonathan piloting his ZX-10R Superbike at the home of World Superbike racing, Donington Park Circuit, about to claim a home win ending Tom Sykes nine straight victories at the circuit. 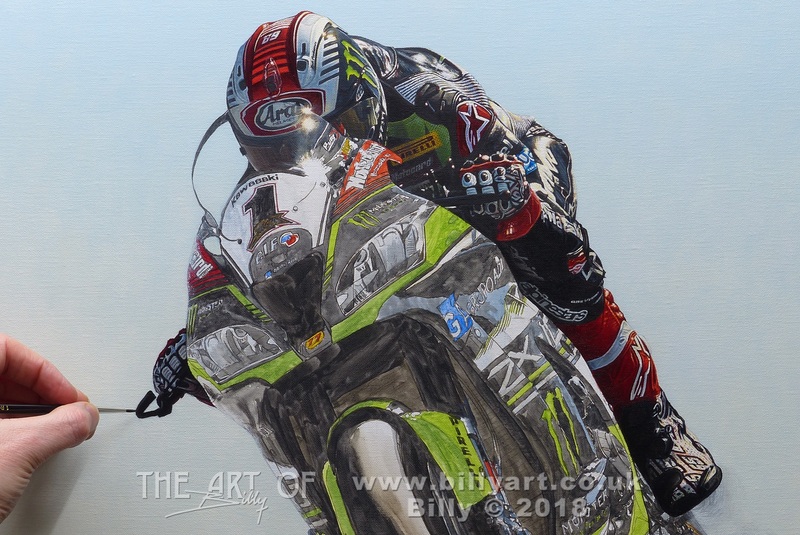 This entry was posted in Motorcycles, The Art of Billy Blog and tagged Billy Art, billy the artist, giclée, Jonathan Rea, Oil Painting, time-lapse, Timelapse, World SBK, World Superbike, World Superbike Champions, WSB, WSBK on 18/04/2018 by billy. & available in multiple Amazon nation’s stores. This entry was posted in Books, The Art of Billy Blog and tagged Agatha Christie, Amazon, Cosy Mystery, Cozy Mystery, eBook, eBooks, John Constable, Murder Mystery, Oil Painting, paperback, Sharon Bill, watercolour, Whitworth Art Gallery on 26/01/2018 by billy. A unique TT collectors piece of art. 1 – 50 and a lot of the higher numbers, 133, 136, 315, 333 etc, have already gone. Order early for Christmas   – last UK post is about the 20th December 2017. International orders need to be shipped in early December. This entry was posted in Motorcycles, The Art of Billy Blog and tagged Automotive Art, Billy, Billy Art, billy the artist, Isle of Man TT, Michael Dunlop, Motorcycle Art, Oil Painting, Rosemary and Company Brushes, Senior TT, Suzuki GSXR, TT, Winsor and Newton on 04/12/2017 by billy. Here is my Michael Dunlop 2017 Senior TT oil on linen canvas painting titled ‘Charging Bull’. This full HD time-lapse shows the ‘The Bull’ of the Keppel Gate corner being painted, including the ‘Road Furniture’ hazard bollards as Michael Dunlop goes on his way to his 3rd Isle of Man TT Senior victory riding the Hawk Racing Suzuki GSXR 1000cc Superbike in its maiden year. I use Rosemary and Company Brushes and Winsor and Newton Artist Oil Paints to produce my art. 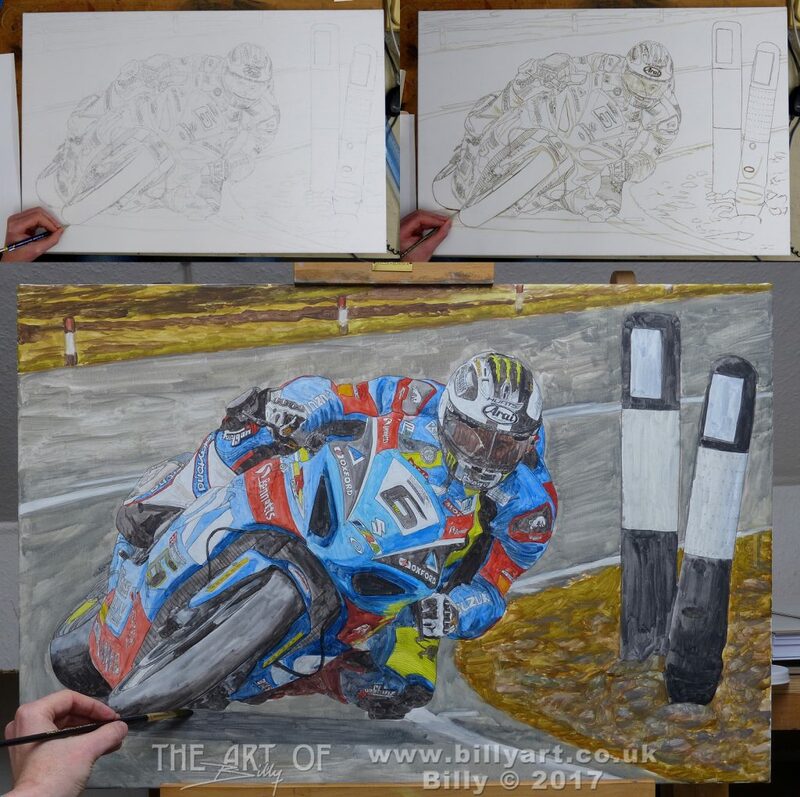 This entry was posted in Motorcycles, The Art of Billy Blog and tagged Automotive Art, Billy, Billy Art, billy the artist, Isle of Man TT, Michael Dunlop, Motorcycle Art, Oil Painting, Road Racing, Rosemary and Company Brushes, Senior TT, Suzuki GSXR, time-lapse, Timelapse, TT, Winsor and Newton on 04/12/2017 by billy. 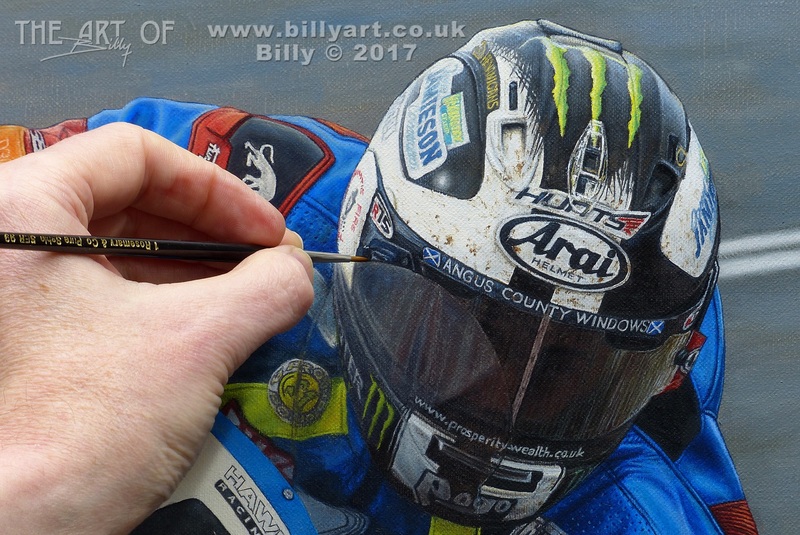 Michael Dunlop 2017 Isle of Man Senior TT Oil Painting by Billy – Work In Progress Update on the Suzuki GSXR Fairing. 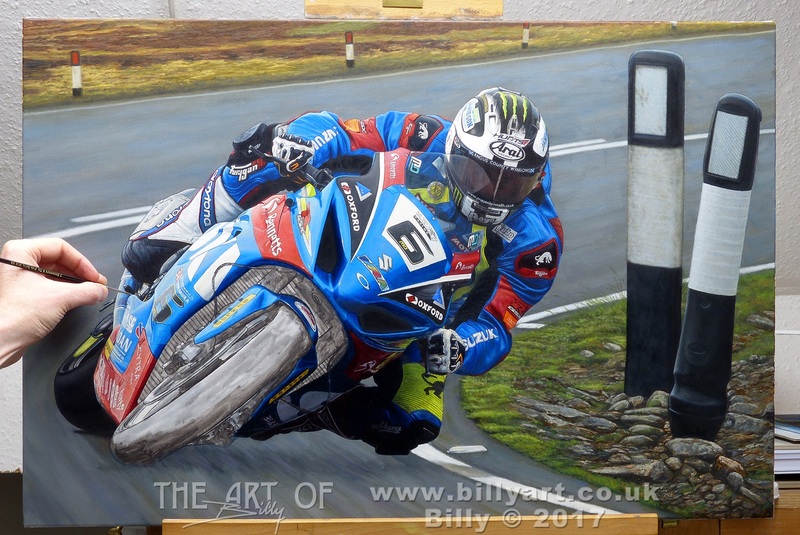 This entry was posted in Motorcycles, The Art of Billy Blog and tagged Billy, Billy Art, billy the artist, Isle of Man TT, Michael Dunlop, Oil Painting, Rosemary and Company Brushes, Senior TT, Suzuki GSXR, TT, Winsor and Newton on 27/11/2017 by billy. Michael Dunlop’s Arai Crash Helmet detail taken from Billy’s oil painting of the 2017 Isle of Man Senior TT. This entry was posted in Motorcycles, The Art of Billy Blog and tagged Billy, Billy Art, billy the artist, Isle of Man TT, Michael Dunlop, Oil Painting, Senior TT, Suzuki GSXR, TT on 27/11/2017 by billy. Here is my current canvas on my easel. Michael Dunlop riding the Suzuki GSXR Superbike to victory in the 2017 Isle of Man Senior TT. This image shows the pencil line, underpainting line and then the first stage of painting, getting the colour down all over the canvas. Michael Dunlop 2017 Isle of Man Senior TT oil painting by Billy. Work In Progress update 1. 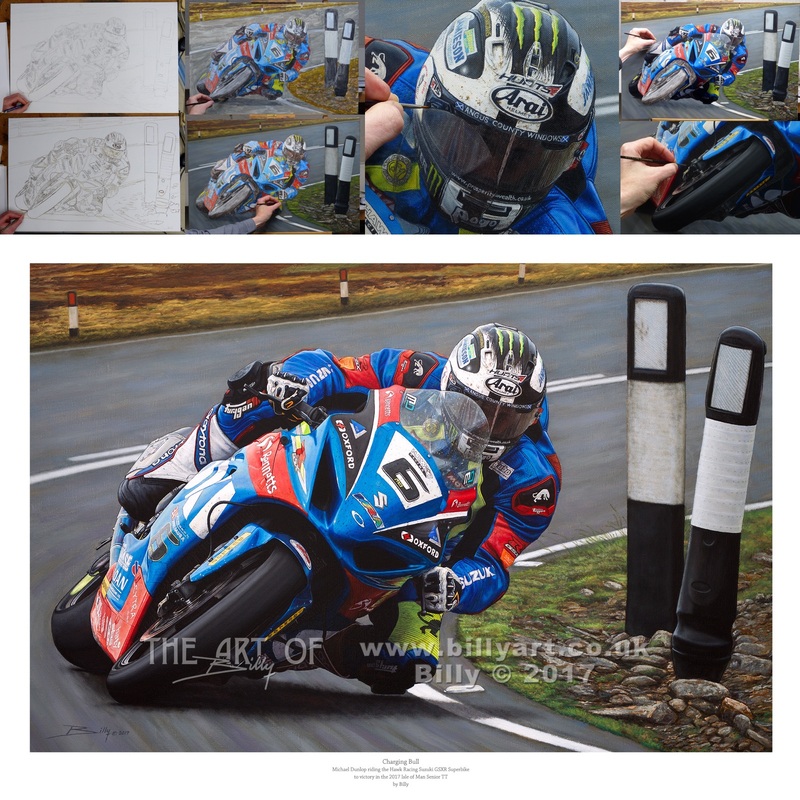 This entry was posted in Motorcycles, The Art of Billy Blog and tagged Arai, Billy, Billy Art, billy the artist, Isle of Man TT, Michael Dunlop, Oil Painting, Senior TT, Suzuki GSXR on 16/10/2017 by billy. ‘The Doctor’ Valentino Rossi on his 2017 Yamaha YZR-M1 MotoGP race bike print taken from my oil painting. ‘The Doctor’ Valentino Rossi 2017 Yamaha YZR-M1 MotoGP oil painting by Billy. Fine Art Print available now. This entry was posted in Motorcycles, The Art of Billy Blog and tagged Billy, Billy Art, billy the artist, fine art prints, MotoGP, Oil Painting, Rossi, The Doctor, Valentino Rossi, Yamaha, YZR M1 on 06/10/2017 by billy.